From the midst of a Blizzard the madman of metal moved on to his Diary. The line-up of the band was “youthalized” a bit in the form of the rhythm section, with Rudy Sarzo and Tommy Aldridge taking over the bass and drums respectively. Even though there has been some speculation concerning if they were just credited in the sleeve of the album for contractual reasons or whatever while Daisley and Kerslake were still the ones bashing it out in the studio. 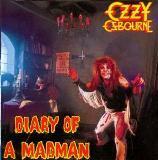 Despite all this, several interviews of Ozzy et al from this time have brought out the fact that Diary Of A Madman was made under considerable hurry, as to not to lose any of the rising momentum caused by the spectacular debut, and I must say that this alleged rushing seems quite obvious when listening to this record. Ozzy is Ozzy on Diary, in all the good and bad qualities that come with it depending on who is listening. His singing is passionate and very very Ozzy-like to the bone. Randy Rhoads simply solidifies his status as a guitar-übermaestro. His riffing and especially soloing is so fluid, effortless, technical but yet memorable that its hard to decide whether to cry of joy or envy. Randy is the only one who can get a perfectomundo-rating on this record. The rhythm section keeps the beats steady and rolling, though nothing truly phenomenal comes out from their part. Then we get to the weakest part, the actual song material. Over The Mountain is quite weak for a album opener, especially when considering how I Don’t Know knocks one directly down for the count to start off Blizzard. The “hit song” of Diary, Flying High Again is an excellent rocking party tune that saves a lot for the album. The lyrical content of the song is quite hilarious. I just wish I could have been in the studio as the vocals for Flying were recorded, so I could have seen if Ozzy was as full-tilt-stoned as he seems to be when listening to his singing or is he just this skilful in voice-acting. You Cant Kill Rock N Roll and Believer are also very good rockers where Randy steals the entire show with his massive axe-widdling. Then we come to a bad slump with Little Dolls and S.A.T.O. Just two horribly uninteresting songs when compared to the extremely high standard that can be set with Ozzys solo material. The ballad counterpart for Goodbye to Romance, Tonight luckily saves a lot in the middle of these two songs, as it is a very beautiful and emotion-rich mellower. The epic title tune luckily brings the album to an excellent closure with the basis of some acoustic moodswings and heavy tempo changes. The production for the record is very good. But then there is an entirely different reason why this record holds a very special value for me. Diary Of A Madman was the final record Randy Rhoads played on that was released during his lifetime. For as many of you probably know, in the middle of Diarys promotional tour - mid-march if I recollect correctly - Randy and a tour assistant along with the pilot died in a horrible plane crash that was meant to be just a short joyride. The rock & metal world suffered a humongous loss that fateful day, as Randys classical-with-rock style was quite unique all the way the guitar sounds and only God knows now what it could have evolved into. But from another point of view, it is a testament to Randys unbelievable power of influence that he is so highly regarded as an icon of inspiration among millions of players, from your average Joe Sixshredder to Zakk Wylde after just two studio albums and one posthumous live disc (Yeayea, there are also the Quiet Riot-recordings, but lets be honest, Randy is known for the Ozzy material). We always have that material, and can reflect upon it, be inspired and carry that legacy forward. Get Blizzard and Diary now, for they are not only great metal, but historical pieces as well.